Daytona in her Subaru Outback. ﻿Subaru of America is selling products to man's best friend. Several "Dog tested. Dog approved" products are promoted on their website, Subaru.com. You can buy a dog leash, collar, or flying disk with "Subaru" proudly emblazoned on it. Diehard Subaru owners will go for the "Pet Food Scoop", "Pooch Water Bottle" or the "Dog Bandana". I like the idea of a poop "Bag Dispenser with Carabiner" for long doggie hikes. 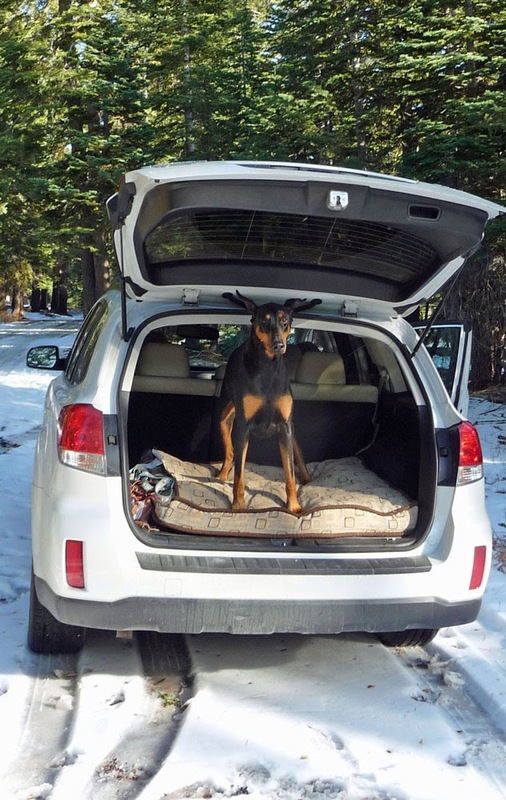 After a long day of hiking, your dog may enjoy a snooze on the Subaru "Orthopedic Pet Bed". Once you finish ordering your dog supplies, be sure to visit the Grant Weber, "Subaru Canine Sales Associate" section. Grant Weber has a series of commercials with dogs behind the wheel and dogs at the sales lot. Take your dog in for a test drive now!